Plantar fasciitis can be an extremely painful diagnosis to have in one or both feet. Once a person develops plantar fasciitis, it can become difficult to even walk, especially those first steps out of bed in the morning, due to the pain. The cause of plantar fasciitis is small micro tears in the tissue that connects the heel to the toes along the bottom of each foot. Injuring this tissue can have very long recovery time and until it is fully healed people are highly susceptible to re-injury. In extreme cases, people do require surgery to repair the damage to the tissue in their foot or feet but this is very rare. Most of the time, it can be successfully treated with over-the-counter anti-inflammatories and flexibility and strengthening exercises. One very important step in alleviating pain and allowing the feet to heal completely is finding a comfortable foot stretcher for plantar fasciitis. There are quite a few different types of foot stretchers made to help treat plantar fasciitis pain. Some are sock-like and can be worn overnight to keep the tissue on the bottom of the foot stretched and allow the body to heal. This helps reduce the pain people suffer from first thing in the morning from this injury. One more type of foot stretcher is a portable half-moon rocker that helps to stretch the feet and Achilles tendon to help reduce plantar fasciitis pain and speed up healing. There are other foot stretchers that are able to be worn twenty-four hours a day, with or without socks and shoes, these stretchers remove almost all tension on the arches with each step a person takes. Other stretchers are made only to be worn while sitting or lying down; these also keep the foot flexed in such a way that little or no pressure is put on the part of the foot that is injured. 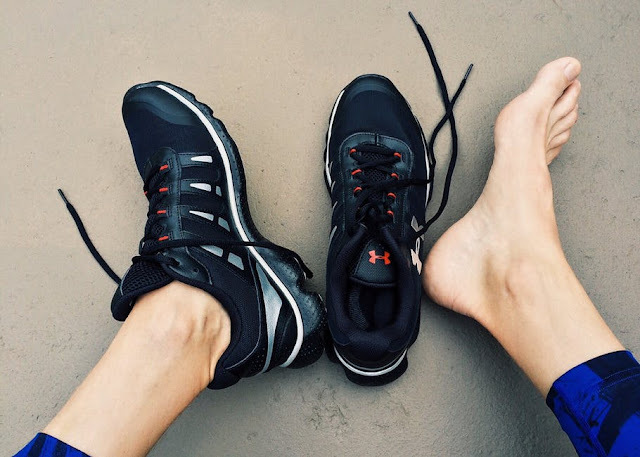 Stretching the foot or feet can help to boost circulation to the inflamed plantar fascia ligament, improving foot flexibility and strengthening key muscles in the feet. All of these foot stretchers for plantar fasciitis work to reduce the amount of pain associated with this particular injury and help to allow the foot or feet to heal correctly in some cases slightly faster. Some stretchers are more expensive than others while most do the same thing just in a different way, what is important is to find the right foot stretcher for your foot or feet. There are some additional ways to help reduce the pain associated with plantar fasciitis. Icing the foot, particularly the arches, will help reduce swelling and also the pain level. Another way to alleviate the pain is with heat, wrapping the injured foot with hot towels or soaking them in hot water. Something else a person can do is try to find better shoes that have good built-in arch support or use some arch supporting insole inserts. Such a high number of people have dealt with plantar fasciitis or will suffer from it at some point in their lives. In fact, plantar fasciitis is probably one of the most common causes of heel pain. When a person suffers prolonged foot or heel pain, trying a foot stretcher may help to mitigate some of the pain they are experiencing. Always check with a physician for a proper diagnosis. If at anytime when using a foot stretcher the pain becomes more severe, take the stretcher off, check and make sure that it is being used correctly. If that does not help, consult a medical professional or try a different foot stretcher. Everyone’s body and feet are different so a stretcher that works for one person may not work for another. I hope you enjoyed this article about tips to relieve your plantar fasciitis and get your speed back on track. Interested in more articles about frugal fit fixes?